Most of the individual exercises during Sifu Mark Rasmus’s workshop, “The Science of Elastic Force,” involved giving our partners enough pressure to allow them to bounce us by absorbing that force and turning it back on us, and vice versa. We were encouraged to sense the “springs” in our elastic joints and connective tissue. And we learned that developing that elasticity takes work. We would alternately “push” and “pull” to open our joints and stretch our connective tissue. Pushing the arms, hands and fingers outwards, stretching the joints, is a natural movement. But then using the muscles in your arms to “pull” back against the reach, stretching and opening the joints, proved to be more of a stretch. 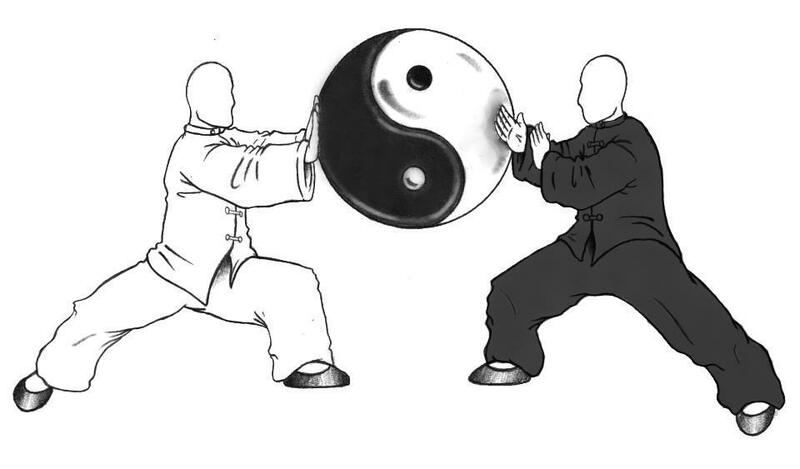 Sifu instructed us to use the magnetic Yin power to absorb the incoming force, drawing our partners off balance in order to make them susceptible to the return Yang power, which he described as electric, the opposite polarity to the magnetic force. How “electric” we were in response to our partner’s push depended on how well we were cultivating the elasticity of our joints and connective tissue. It was hard to miss the difference between the electric force that Rasmus generated compared with the less assertive movements of his students. Using his arms only to “feel” the balance of his partner, his body would pulse against the incoming pressure, bouncing his partner violently but catching him with his sensing hand to avoid injury. I have used “partner” and “opponent” alternately in describing this training to distinguish between developing the techniques in practice and using the techniques for self-defense. Our Sifu made clear, however, that the practice partner is an essential condition for becoming adept at tai chi as a martial art. One cannot simply practice the form and expect to develop the expertise necessary to defend yourself, he said. You have to practice with a partner. 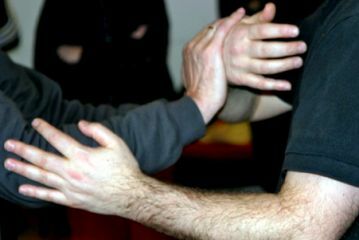 To connect with your partner or your opponent, you must tune into the same frequency, Sifu says, and you find that frequency by touching them gently, by sensing their root and their vibrations. This was perhaps the most difficult concept for me to grasp, and I struggled to gain this sensitivity to vibrations and frequency. Aaron Green, director of Mid Atlantic Movement Arts, sponsor of the workshop, worked with me as my partner a few times, encouraging me to listen with my mind to the “switch” when he could be drawn off balance by my magnetic force. Inevitably, I would see it in his eyes, rather than feel it through the touch. Tai chi teaching demonstrations of fajin – masters “bouncing” their opponents – as seen often on YouTube, may involve complicity of the student, whether overt or otherwise. The master has demonstrated the moves, and the autosuggestion for those who are most sensitive will be enough to move them, sometimes without any visible force. This is not acting, however. 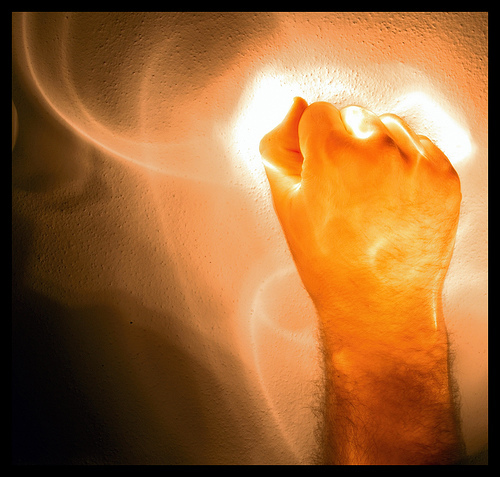 It is a power that exists, particularly among those who do not resist it, who feel the power and respond to it. Drawing from his Hermetics training, Rasmus teaches that we can focus our mind through meditation to increase our magnetic and electrical forces, that we truly have control if we allow our minds to lead. The meditations rely on elements of the earth, water, fire, and “ether,” an astral plane, which correspond to trigrams in the I-Ching, the mystical Chinese Book of Changes. As we sit quietly and meditate on the space between our hands, breathing in and out, Sifu asks us to take one particular thought, something you want, “perfect health, for example, anything,” and project it into the space between our hands, breathe into it and accept it as our own, close up our hands, embrace our thought, make it reality. It is a summons to tai chi warriors to carry our vision forward, to believe and to succeed, guided by this art that focuses the mind and conditions the body to win. Clearly, we must practice. We have much work to do. For more information about Sifu Mark Rasmus and his teaching, check out the website at www.markrasmus.com. He is making plans for another tour of the United States next year. 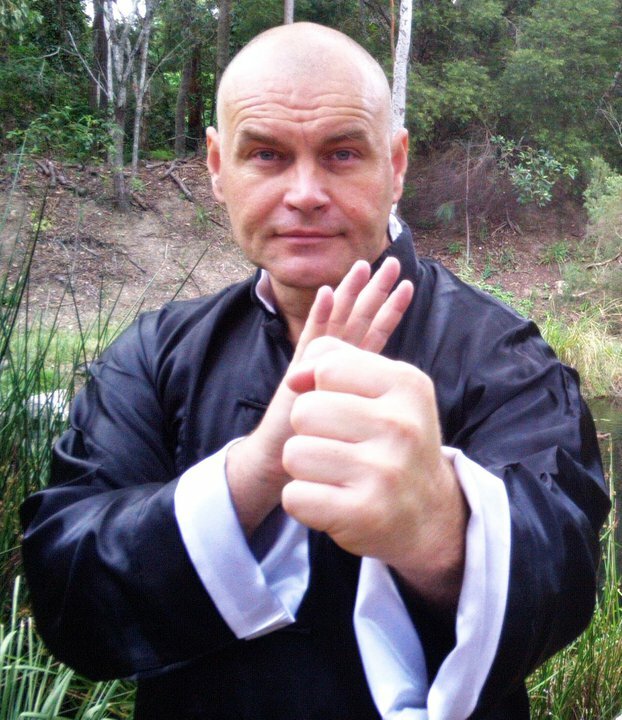 Sifu Mark Rasmus is an imposing man, a lithe heavyweight who has trained wrestlers and boxers, including Thai kick boxers. He is about 6-foot-3 and 245 pounds, by my estimation, although he seems bigger as he moves with quiet energy and purpose, like a big cat. Behind this warrior façade, however, is a gentle man eager to share his knowledge and expertise about tai chi and martial arts in general. You sense that he is sensing you, measuring you, when you meet, and you get used to his mindful approach. You want to answer in kind. You sense his investment in your well being, as your teacher. For our group, Rasmus has synthesized his “building internal power” training into a weekend workshop of 12 hours, “The Science of Elastic Force.” We are 14 tai chi devotees gathered in Frederick, Md., the next-to-last stop in the U.S. tour. Some are tai chi instructors with years of experience; others are just trying to expand their “push-hands” experiences. One comes from New York, and another from Delaware. A few are like me, local enthusiasts feeling lucky that Sifu had come so far, so close. “The Science of Elastic Force” is one part mystical Hermetics, one part Chinese internal martial arts, and one part physiology – a course in body mechanics and flexibility. Connective tissue – ligaments, tendons and the fascia – are the elastic elements that give your body amazing strength, if you choose to train and develop their capacity. We begin both sessions with meditation exercises that extend almost an hour. Sifu stresses the importance of visualizing and breathing in the “life force.” Consecutive meditation exercises ask us to 1) consider each thought that comes into your head, watch each fall away and others arise, enjoying each; 2) isolate one thought that comes to mind and concentrate on that one only, not letting it fade away for at least five minutes; and 3) let your mind go blank, dismissing all thoughts; sink into nothingness. Relax completely. “Stretching” exercises are physically intense and exhausting, literally throwing our arms one way and violently pulling them back, stretching the tendons and opening the joints, a key condition for the “elastic” energy you need to “bounce” your opponent. When Sifu Mark demonstrates the exercise, however, his sweeping arm throws sound like deadly weapons, whistling violently against the wind as the tendons and ligaments are stretched to their limits. I try this with much effort and notice that I am recreating the sound of Sifu’s hurtling tomahawks but with the sound coming from my mouth, a low and restrained whistle reflecting my effort but hardly matching the power of the original. By opening the joints and stretching our connective tissue, we are releasing our bodies to song (hsung), in the Chinese terminology, complete relaxation, a condition of readiness, a precondition for action in tai chi, as Sifu Mark demonstrates on the video, sinking below his partner’s body mass. I’ve practiced tai chi for 25 years, religiously pursuing an almost daily exercise to improve health, balance and mindfulness. It seems to be working within those parameters, but it may be too early to tell. Eventually, I will fall down and lose my mind. It’s just a matter of time, no matter how hard I work to prolong it. (C) The Kwoon, Port Orange, FL. Art by Warren Cain. More recently, I’ve begun to understand how this 200-year-old Chinese martial art form can take you further than simple health and vitality, both physically and mentally. Those ideas began to crystalize during a recent weekend seminar conducted by Sifu Mark Rasmus, a martial artist and former clairvoyant who brings that mysticism to the teaching of tai chi, as I’ll explain later. Tai chi chuan translates to “extreme, ultimate boxing (or fist).” This form of Chinese boxing (yes, these guys were flexing their muscles during the “Boxer Rebellion” in China at the turn of the 20th century) evolved from the martial arts form and practice of the Yang and other families in the 1800s. The Yang form was refined to 37 basic postures and popularized in the United States by Cheng Man-Ch’ing, a renaissance man renowned as the “Master of the Five Excellences” – poetry, calligraphy, painting, Chinese medicine and tai chi. My teachers descended from the group of Americans, particularly Robert E. Smith, who were schooled by Cheng, a man of small stature who easily dispatched them in his New York studio. My teachers have explained that the power of tai chi comes from inside the body and is guided by a mind (yi) that is sensing the “center” and “root” of opponents, and then purposefully directing energy (chi) to neutralize and then dispatch them. When Cheng is at his best, he doesn’t extend his arms in propelling his opponents – or “bouncing” them, as modern tai chi practitioners describe the process the Chinese refer to as “fajin,” or issuing explosive power. He is able to absorb the energy of his attackers and to send it back at them. To understand this process, you really must feel it. Now, after 12 hours of training with Sifu Mark Rasmus, I have a new appreciation for this internal power. 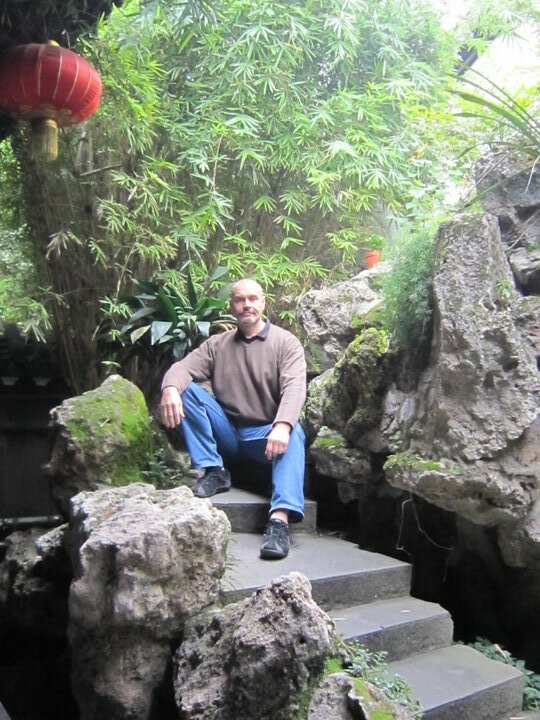 Sifu Mark Rasmus in Chengdu, Sichuan, China. In tai chi, the concepts of chi, as the “life force” you can cultivate with breathing and meditation, and yi, the purposeful mind that allows you to direct this life force, suggest a power that at least borders on the metaphysical. The workshop title, “The Science of Elastic Force” could not disguise the mystical and magical tenor of the teaching of Sifu Mark Rasmus. Tai chi has long had the allure of the mystical, the “secret” behind the underlying power of the internal martial arts. In the Chinese culture, however, these are hardly secrets, just the expression of Taoist and even Confucian belief systems. The concepts of Yin and Yang, for example, are essential Chinese identities, opposite forces that are interconnected and interdependent in the natural world. Understanding this duality in nature and humanity is an ancient road to knowledge in China. Rasmus teaches a western perspective on this duality, drawing from Hermetics, referring to the yin quality as magnetic, the yang quality as electrical. These polarities serve as the springboard for his practice, and his training. As we learned, they intersect neatly with tai chi principles, and they work in the real world.